The guy sitting next to me on the bus to Lake Coatepeque sounds like he’s got a bowl of soup in his mouth. Each time he says something I shrug and tell him I don’t understand, but he keeps going anyway. A man standing in the aisle says something in intelligible Spanish that I understand. We drive from Santa Ana through lush green scenery into small towns where people hop on and off. A woman is selling live chicks on the sidewalk that have been dyed pink, yellow, and blue out of a cardboard box. Her face is timid and innocent. I cannot pass judgment. The bus descends on the large lake from the hills. Uneven dirt roads make the ride bumpy and slow. We never get as close to the water as I think we will, so I take too long to get off. I have to backtrack so I can at least get close to the lake. I eat and take a private tour around the lake on a guy’s boat. I reluctantly pay him $10 after refusing to pay $15, but since it was just me on the boat I’m don’t feel hosed. If I were to go again, I would visit one of the bars hanging off the hillsides overlooking the lake before leaving. The views are outstanding and the beer is cheap. I get on the bus back from Lake Coatepeque to Santa Ana when the bus driver is turning around and taking a break. He chats with me and tells me that a year ago he had a group of American tourists on his bus. He gives me the impression that I’m the first Estadounidense he’s encountered since then. The bus’s fare collector pours water into the radiator. At least I hope it’s water, because he takes a big swig from the jug afterwards. The bus is crowded on the way back. Men board with their large machetes on their belts. The wealthy that own homes on the lake ride in their designer clothes alongside schoolchildren and women who still wear their cooking aprons. People pile on without bother. No one seems to be annoyed to cram on, only amused when they struggle for something to grab as the bus bounces around. Vendors come on and off selling fruits, drinks, nuts, miscellany. Back in Santa Ana, everyone abruptly exits the bus. I ask the bus driver where we are, and he takes me out of his way to get me closer to where I’m staying. When people think of ‘tourist friendly’ places, they usually think of orderly streets, cafes with wifi, English speaking tour operators. Not much of that will be found in Santa Ana, El Salvador, but it is one of the most traveler friendly places I’ve ever been. When I arrive from Guatemala by bus, I walk the streets looking for my hostel. Everyone on the street was eager to help me with a smile. My hostel, Casa Frolaz (no online booking), is located a 15 or 20 minute walk outside the city center. Francisco, the owner, immediately tells me all the things I can see and do around the area, and what buses to take to get there. Once I know what number bus to catch, the rest is pretty easy, given the amiable residents. Down the street from Casa Frolaz, I go to get some papusas at a small restaurant on a porch. Plastic tables with large containers of pickled cabbage sitting on top are huddled around the plancha where I stuff myself with papusas and drink a papaya and milk licuado (blended with ice). I eat way too much for $3.40. The lady cooking the papusas says to me what I assume are jokes because she laughs. She asks me if I’m understanding, and when I just shrug my shoulders and smile, she keeps going. Santa Ana had a charm that I didn’t find in larger San Salvador, which just seemed like a sprawl of neighborhoods, some wealthy and full of guards with rifles, and others impoverished and dirty. In Santa Ana, one can walk through the peaceful marketplace, which extends into the neighboring streets in the center of town. If you get tired, there are makeshift bars to get a beer. Add that to the list of Quintessential Latin American Old Man Activities, along with getting one’s shoes shined and/or reading the paper in the central square all day. I didn’t get as much time as I’d like in El Salvador, but traveling inside the country is extremely easy and friendly. I traveled in an air-conditioned bus from Santa Ana to San Salvador for less than $1.50. If I had more time and money I would have checked out the Ruta de las Flores, near the Guatemalan border, some of the national parks, and maybe head for the coast. Any of those places can be reached for mere dollars. I planned on visiting the ruins at Tazumal, but unfortunately my body forced me to take a day of rest, as fever and exhaustion set in. For now, El Salvador might not be the best place for tourists, but it is definitely an excellent place for travelers. Spanish skills seemed essential in the places I visited, but I’ve heard that the coast is full of English speakers. If you are in Guatemala, Honduras, or Nicaragua, El Salvador is not to be overlooked. Hidden gems are a friendly recommendation away. This entry was posted on June 24, 2013 by alexjparton. 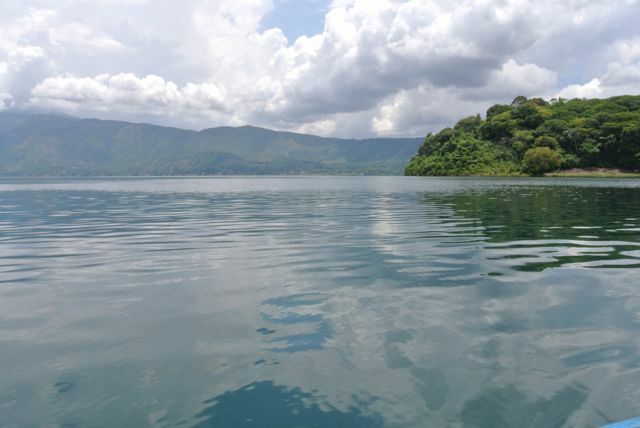 It was filed under Americas, El Salvador, Travel and was tagged with bus travel, central america, el salvador, lake coatepeque, papusas, santa ana, tourists, travelers. Great post – informative and interesting! Thank you! I hope you can enjoy El Salvador too. It’s a gem.